Why do appetites change as we age? Changes in metabolism: We move less and our metabolism slows. That reduces the energy our body spends, so we do not need as much “fuel” for our bodies. For some, this could also mean a reduced appetite. Sense of taste changes: Our ability to taste can decline with age. Some medications may also affect it, which can decrease your interest in food. Difficult or painful chewing: Missing teeth or ill-fitting dentures can make chewing difficult or even painful. Some seniors may also develop dysphagia, or difficulty swallowing, as the result of a stroke, dementia, or another disorder. While foods can be modified to make them easier to eat by pureeing or adding thickeners, it can make meals less appetizing. As we age, our risk of getting sick increases. Chronic illnesses like diabetes and high blood pressure can become more difficult to control. Inadequate nutrition due to poor diet can trigger or worsen these illnesses and complicate recovery. Why is being underweight a problem? When someone with a healthy weight gets ill and cannot eat enough, their body has some reserves to draw from to sustain itself. But in underweight individuals, these reserves are often depleted. As a result, risk of sickness increases, illnesses can hit harder, and it can take longer to recover. Loss of lean muscle mass can result in physical weakness. That can make it even harder to purchase, prepare, or eat food, potentially creating a vicious cycle. A lack of body fat can make it harder to stay warm, and the decrease in “cushioning” can increase the risk of fractures in the event of a fall. What steps can seniors take to add some needed calories to their diet? Use a healthy fat like olive oil in dishes and dressings to add lots of calories. Adding dry milk powder to soups or mashed potatoes boosts calories and protein content. As long as it can be chewed and swallowed safely, I like recommending peanut butter. It is high in calories from healthy fats, a good source of protein and fiber, fairly cheap, and generally well-liked. Other nuts or nut butters can also work well. How can you spark an elder’s appetite? Prepare their favorite foods regularly. Remember that presentation matters. A colorful plate of various foods may catch the eye and stimulate interest in eating. Smaller, more frequent meals may be better tolerated than trying to eat a few larger meals. The sight of too much food can be overwhelming and decrease appetite. Some elders may eat better in social settings, like with family or friends, or at a senior center. The Ocean State Senior Congregate Dining Program serves a modestly priced hot lunch on weekdays at more than 65 locations. Find one near you by calling 401-437-1000. 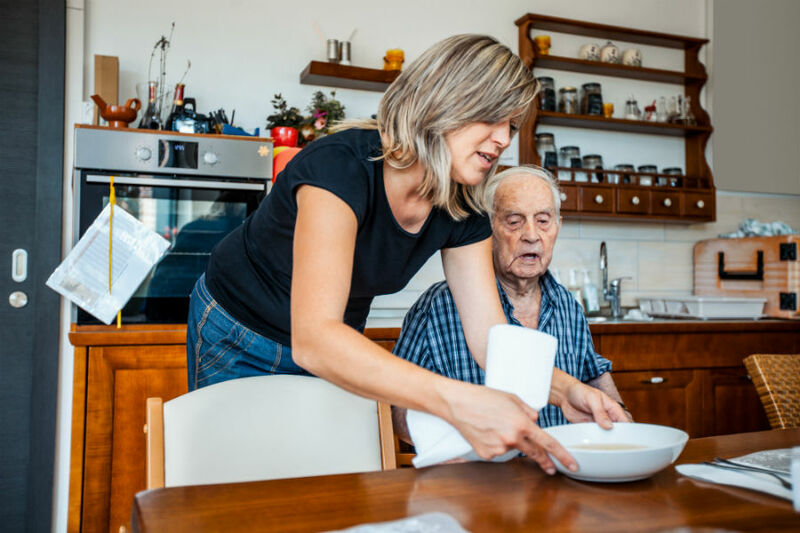 For qualified homebound seniors, Meals on Wheels of Rhode Island delivers food five days a week. Contact them at 401-351-6700 or visit www.rimeals.org. How important is good hydration? By weight, our bodies are mostly water, and we need to keep ourselves hydrated to keep things running smoothly. Among other things, staying hydrated helps keep our bowels moving regularly. People looking to stay hydrated and increase their calorie intake should choose beverages such as milk, fruit juice, or supplement drinks. For the seniors in your life, please consider these helpful tips. Be sure to visit the Nourishing section of Lifespan Living for more helpful tips on healthy eating, and sign up to receive a regular enewsletter. Steven McPartland is a registered dietitian/nutritionist at Newport Hospital. He provides guidance and diet education to hospital staff and patients to optimize nutrition for recovery during and after hospitalization.